No serious scholar denies that Buddhist themes and ideas can be found throughout Zhu Xi’s philosophy and not just as objects of criticisms; Zhu clearly incorporated various Buddhist ideas and metaphors directly into his system and developed his own versions of some of these as well. Reviewed by Philip J. Ivanhoe ( November 28, 2018, Hong Kong, Sri Lanka Guardian) This volume aims at answering important questions about the historical sources of Zhu Xi’s philosophical system; it includes a wealth of information about earlier, Buddhist philosophical writings and makes clear how some of these appear to have informed and influenced the development of Zhu’s philosophical system. I will very briefly describe the contents of the volume, highlighting some of the ways in which the various chapters fill out our understanding of how Chinese Buddhist philosophy provided sources and context for the development of Zhu’s thought. I then will consider what the volume aims to and does achieve. The volume begins with an Introduction that is a substantial scholarly contribution in itself. The editor, John Makeham, describes and illustrates both the aims and methods of the collection and notes that while, united in their belief in the importance of tracing the Buddhist roots of Zhu Xi’s philosophy, the contributors do not always speak in a single voice about the nature or extent of these historical influences or the process by which some of them came to be incorporated into Zhu Xi’s philosophy. Makeham also presents clear and succinct synopses of the five chapters that follow. In chapter one, John Jorgensen explores the ways in which teachings about “the radiant Buddha-nature of the tathāgatagarbha tradition of Buddhism” informed and inspired Zhu Xi’s ideas about “the radiance of human nature” (pp. 39-40). 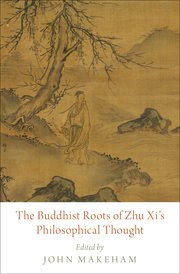 He begins with a helpful description of some core Chan doctrines that offered much of the historical context of Zhu Xi’s interactions with Buddhism and then proceeds to provide an extensive and meticulous account of the ideas, images, and metaphors used to convey the central teachings of the tathāgatagarbha tradition. A characteristic theme of this literature and one that Jorgensen shows influenced Zhu’s thinking in a number of ways is the powerful radiance of the Buddha-nature. Jorgensen examines not only the nature of such radiance but also issues such as who can perceive it, what it can illuminate, and how it can become obscured. Such teachings held profound implications for the possibility of enlightenment in Buddhism and subsequently, Jorgensen argues, for the possibility of sage-hood in Zhu Xi’s neo-Confucian philosophy. This chapter is a treasury of primary textual sources and makes a strong case for the structural similarity between important aspects of Zhu’s views about human nature and earlier Buddhist beliefs about Buddha-nature. In the second contribution, “Zhu Xi’s Critique of Buddhism: Selfishness, Salvation, and Self-Cultivation,” Justin Tiwald seeks to refocus long-standing interests, which appear in later Confucian writings on Zhu Xi, about how well Zhu understood Buddhism or how fair he was in his criticisms of Buddhist teachings. Such questions recommend themselves to those who know that Zhu studied Buddhism deeply, extensively, and throughout much of the first third of his life and yet he often seems to get Buddhist teachings wrong, straw-mans them, or offers rather flat-footed criticisms. Tiwald contends that this impression is at least partly the result of the mistaken assumption that Zhu intended to represent accurately Buddhist ideas when advancing most of his major criticisms. Instead, Tiwald argues, we should see that “Zhu was more interested in the views that Buddhist theories and practices presupposed . . . (and) in the shape that Buddhist doctrines took when put to the test by practitioners” (p. 123). In other words, Zhu’s criticisms were based primarily upon what he saw as the implausible and unappealing assumptions and implications of Buddhist teachings rather than on accurate representations and analyses of their doctrines. One example of his concern with the implications of Buddhist teachings is Zhu’s oft-repeated charge that Buddhism leads its practitioners to ever-greater selfishness because its ultimate aim of salvation points them away from care for the world. This criticism has deeper significance for neo-Confucians because of their belief that the only way to develop greater care for the world is to devote oneself to extending the natural empathy and sympathetic concern we feel for other people, creatures, and things. So, while ostensibly dedicated to “great compassion,” Buddhists lack the practical means to develop genuine care. Moreover, the faith they express for their tradition, which masks their underlying desire for personal salvation, reveals that, “their belief is insincere, thereby lacking in the crucial element — sincerity or integrity (cheng 誠) — that makes true virtue possible” (p. 130). In chapter three, “Buddhism and Zhu Xi’s Epistemology of Discernment,” Stephen C. Angle describes three representative Chinese Buddhist approaches to epistemology that may well have influenced Zhu Xi’s thinking on how one comes to genuine knowledge. While Angle recognizes that such sources almost certainly influenced the structure as well as the content of Zhu Xi’s teachings about epistemology, he insists that we must not overlook the important differences that exist between his views and these earlier Buddhist precedents. Succinctly stated, his view is that, “Zhu Xi’s epistemology does not co-opt the Chan Buddhist structure . . . while getting some of its underlying shape from the shared discourse, [it] has quite distinct concerns and goals” (p. 157). One of the most original and revealing features of Angle’s analysis is his lapidary account of the interaction between the Buddhist and Confucian traditions. Rather than drawing straight lines between texts or ideas, he argues that we need to look at and overlay four major factors or forces that shaped this interaction: (1) philosophical developments within Chinese Buddhism, (2) the emergence of a shared Confucian, Buddhist, and Daoist discourse in the late Tang, (3) the role Cheng Yi and two of his students played in the Confucian rapprochement with Buddhism, and (4) Zhu Xi’s personal experience with Buddhism. When we do this, we come to see an increasingly complex, multifaceted, and subtly inflected picture. Angle concludes by comparing Zhu’s epistemological views with earlier Buddhist precedents in regard to five issues: the underlying structure of knowing, the need to cultivate the self in order to understand, the relationships between different types and levels of knowing, the extent to which knowledge is innate, and the role of faith in the process of knowing. Brook A. Ziporyn contributes chapter four, “The Ti-Yong 體用Model and Its Discontents: Models of Ambiguous Priority in Chinese Buddhism and Zhu Xi’s Neo-Confucianism.” Ti and yong are philosophical terms of art found in early, pre-Buddhist Chinese texts. Commonly translated “substance” and “function” they often mean something like what a thing is in itself or its inherent reality and how it naturally functions, responds, or behaves in the world. One classic example of ti and yong, found in the Platform Sutra, is a lighted lamp and its light; neo-Confucians often invoked these paired terms to convey the idea that human nature in itself (ti) naturally functions (yong) or manifests itself through practice of the virtues. Ziporyn leaves the terms un-translated; he is primarily interested in different models consisting of the pair in Chinese Buddhism and Zhu Xi’s philosophy. He describes three such models: the first is found in some pre-Buddhist texts as well as Huayan Buddhism and has two forms — the classic ti-yong model and a radicalized version; the second is found in Tiantai Buddhism, and the third in Zhu Xi’s neo-Confucianism. All three models represent fundamental metaphysical views that involve distinctive conceptions of “the relation between one and many, between prior and posterior, between foundational and derivative, between formless and formed, between unperceived and perceived, between indeterminate and determinate, between center and periphery” (p. 193). As can be seen from the above quote, the ti-yong model purportedly does a lot of heavy lifting across these different traditions and schools; there is no doubt that the terms were important for both Buddhists and Zhu Xi, as well as for other Chinese thinkers — Daoist and Confucian — who predated as well as followed those discussed in this chapter. Ziporyn presents a very dense and detailed account of the ti-yong model in Huayan and Tiantai Buddhism and argues that Zhu Xi appropriated and modified such views and used them, for example, to develop his distinctive teachings about the ways in which pattern-principle (li 理) does or does not “pre-exist” qi. In Ziporyn’s opinion, “Zhu Xi’s case lies interestingly right between the two Buddhist cases” (p. 236). Ziporyn presents valuable translations of the texts that form the basis of his argument and a great deal of interpretive explanation and analysis as well. At times, it is not altogether clear how the textual evidence and interpretation fit together. For example, throughout the section on Zhu Xi’s version of the ti-yong model, Ziporyn insists that Zhu Xi appeals to “Centrality,” a concept that we are told is “synonymous with the actual effectivity (sic) of the Li that stands above and within all manifest existence (also Taiji)” (p. 236). Once understood, this may be a useful way to describe aspects of Zhu Xi’s teachings, but the manner in which it is presented may lead readers to believe that Ziporyn is referring to a specific term found in Zhu Xi’s writings. Now, there are terms that one could reasonably translate as “centrality” such as 中, but that does not appear to be what Ziporyn has in mind. In the two passages that follow his introduction, which are presented as supporting his interpretation of “Centrality,” neither the word nor anything equivalent appears. This is puzzling since the argument is that this is one of the key notions that Zhu picked up from Tiantai Buddhism; one expects to be shown the textual trail leading from the Buddhist sources to Zhu Xi’s corpus but none is provided. In the fifth and final chapter, “Monism and the Problem of Ignorance and Badness in Chinese Buddhism and Zhu Xi’s Neo-Confucianism,” John Makeham describes a constellation of ideas derived from the late 6th century Buddhist work, the Treatise on Giving Rise to Faith in the Great Vehicle, that became “a shared resource for East Asian philosophers and religious theorists over the course of centuries and continue to do so even today” (p. 277). Makeham’s central focus is to show that while the Treatise explicitly advocates ontological monism, it does not sufficiently defend such a view; moreover, the text leaves itself open to and in certain respects encourages an alternative, dualist point of view. This vulnerability is especially acute in regard to its explanation of the origin of ignorance, which, given its overall philosophy, amounts to “an account of how badness, evil and suffering arise” (p. 278). Briefly put, the text maintains that the intrinsic reality (ti 體) of the mind is perfectly pure, devoid of any conceptual overlay that might distort or defile it, and the source of everything. At the same time, it holds that ignorance prevents most sentient creatures from realizing the inherent purity of the mind. Their explanation of the origin of badness seems to introduce a fundamental dualism — between the mind and ignorance, purity and defilement — into their official monism. Zhu Xi’s philosophy reflects much of the structure of the “shared resource” that Makeham presents. He believed in the goodness of human nature and drew upon several of the Buddhist precedents described in developing his philosophical system, within which the intrinsic reality (ti 體) of the nature was perfectly pure “pattern” (li 理) and badness arose only because of the obscuration and impediment introduced by qi 氣. He too advocated a monistic ontology of pattern and traced the origin of badness to a foreign influence that interferes with its natural function (yong 用). It seems that in doing so, like his Buddhist predecessors, he too was haunted by a creeping dualism that undermines his official, monistic ontology, but Makeham maintains that Zhu avoids repeating the Buddhist mistake by developing, “a monistic ontology in which the conditions that make badness possible are not associated with pattern but rather are associated with qi, but with the crucial stipulation that there can be no pattern without qi” (p. 334). No serious scholar denies that Buddhist themes and ideas can be found throughout Zhu Xi’s philosophy and not just as objects of criticisms; Zhu clearly incorporated various Buddhist ideas and metaphors directly into his system and developed his own versions of some of these as well. Moreover, he and every other neo-Confucian adopts a characteristically Buddhist style of argument, for example by developing complex metaphysical arguments concerning deep and enduring conceptions of oneness between the self and the world that ground comprehensive ethics of care. While there is agreement about the existence of Buddhist influences of various kinds in Zhu’s thought there is less consensus on which elements of his thought find clear precedents in Buddhism, why these elements are there, or how they function as features of his thought. Some believe the presence of such elements is more “accidental than purposeful.” Some believe they represent strategic borrowings by Zhu Xi designed to fend off or coopt parts of the competing Buddhist tradition. Most of the contributors to this volume see the Buddhist elements in Zhu’s thought as the intentional “repurposing” of Buddhist ideas to construct or support his own philosophical system. In my view, all of these explanations have some merit but account for different parts of Zhu’s philosophy. Versions of the first explanation often seem more plausible when we are trying to understand the fundamental orientation or style of neo-Confucians like Zhu, things like his conception of what it is to do philosophy, that were shared among Chinese intellectuals of his age. The latter view, characteristic of most of the contributors to this volume, often is right when what is under consideration is a specific concept or idea. Aside from these considerations, there remain questions about what the richer and more complete account of Buddhist influence that the volume works to provide adds to our understanding of Zhu Xi’s philosophy. The editor and a number of the contributors endorse what I shall call a strict historical-causal thesis: the idea that a fairly complete and accurate picture of the Buddhist roots of Zhu’s thought is necessary in order to understand what his philosophy has to say. Echoing ideas one finds among neo-Confucians, they hold that the roots may be hidden, but until one ferrets them out one cannot truly grasp what the “branches” of Zhu Xi’s system are saying. In the Introduction we are told that an accurate understanding of key aspects of Zhu’s philosophy “can be achieved only by understanding the Buddhist contributions to the development of these and related concepts and to the theoretical debates that informed that development over the course of centuries” (p. 34). This strikes me as much too strong a claim (the good news, though, is that it is not in any way required to support the value of the work under review). It is implausible to say that we cannot understand Zhu’s philosophy without understanding the influence of Buddhism, and in fact we might understand it less well if we approach his philosophy too firmly committed (dare I say attached) to such a belief. We don’t want to be like the man with a hammer in his hand to whom everything looks like a nail (more on this below). It is, though, correct and important to say that a sophisticated appreciation of Buddhist philosophy can facilitate grasping Zhu’s thought, particularly in regard to some of his specific criticisms of Buddhist doctrine, and, what is different, can give us a more accurate and complete historical account of its development. The problems here concern the nature and value of doing history of philosophy or more broadly, intellectual history. The strong claim advanced by several contributors to this volume is that history is necessary for understanding philosophical ideas. In addition to posing possible dangers, like the one described above, this view runs into a regress problem, which I shall touch upon below; it also seems to rely upon a mistaken epistemological commitment: that historical accounts are the only way to appreciate philosophical claims. Among the problems that plague such a view is that it appears to assume there is only one way to arrive at a particular philosophical belief, that unless we pass through a particular historical process we can’t arrive at certain kinds of philosophical beliefs. This is untenable. It is like someone who discovers that a distant culture wears pants with two legs just as we do and concludes from this that there must have been contact and influence between the two cultures. Sometimes the explanation for similar ideas, arguments, or practices lies in some feature of human nature — in the example of pants, physiology — or in the efficacy of some particularly successful response to a shared challenge creatures like us face in the world. The strict historical-causal thesis leads some of the contributors at times to an insufficiently nuanced view of how ideas and language in general and metaphors in particular work. For example, a number of contributors note the importance of the mirror as a metaphor for neo-Confucians like Zhu. They rightly point out that he picks up his particular version of the mirror metaphor — roughly as representing the pure mind obscured by adventitious impurities — most immediately from Chinese Buddhist sources like the Platform Sutra. This is surely right, but because they are excessively intent on tracing all such ideas back to Buddhist sources, they discount how important earlier Chinese precedents are: not only for neo-Confucian uses of the metaphor of the mind-as-mirror but also of course for Chinese Buddhist examples as well. None of the contributors points out that the metaphor of the mind-as-mirror is rarely found in Indian Buddhist sources, seems to have developed largely in China, and with distinctively Chinese characteristics. Some do note that there are precedents in very early Daoist and Confucian texts such as the Zhuangzi and Xunzi but discount the importance of such examples. Zhuangzi uses the mind-as-mirror metaphor to convey how human beings naturally know and respond well to the world before they become defiled by overly self-centered desires. It is true, as one contributor points out (pp. 53-54n77), that Zhuangzi does not draw the precise analogy of corrupted human nature being like a mirror defiled by dust, but this is largely irrelevant to the core features of the metaphor, which is that human beings in their original state are pure, function properly, and only go astray by allowing their original nature and minds to be corrupted by something foreign to them. Moreover, contrary to what is claimed, Zhuangzi and other Daoists argued at length that one must work to undo the bad influences and return to one’s original state by engaging in a distinctive process of cultivation. Returning to an original pure state is one of the most characteristic features of early Daoism and this idea played a major role in the development of certain strains of Chinese Buddhism. Such early Daoists offer a clear example of a recovery model of self-cultivation, and this model and the metaphor were taken up and developed by later Chinese thinkers, first Buddhists and then neo-Confucians. The point here is that the development of Chinese philosophy is a complex story of mutual influence, inspiration, argument, and development. The influence doesn’t just run from Chinese Buddhism to neo-Confucianism; we must sometimes put down that hammer, so that we can see and appreciate greater complexity. This example also illustrates the point made earlier about how historical understanding can enrich our understanding of the development of philosophy but is not necessary for grasping later philosophical views. A careful reader can easily understand Buddhist or neo-Confucian ideas about the mind-as-mirror without knowing the earlier Daoist precedents. If we needed to understand all the precedents for and the particular trajectory leading up to a particular philosophical (or scientific) idea before we could understand the idea, understanding would not be possible. This volume contains a wealth of information about early Buddhist philosophy and how it often influenced, in ways both dramatic and subtle, Zhu Xi’s philosophy. It succeeds in making the case for rather extensive influence and widespread intentional appropriation, providing evidence and argument that is often compelling. At times, some of the contributors claim too much by insisting that we must grasp these Buddhist sources of Zhu’s philosophy in order to understand and appreciate what he is trying to say, but there is no need to rely on such a claim in order to establish the great value of all that the volume achieves. Like many great thinkers, Zhu Xi not only argued against but borrowed from, coopted, and repurposed competing traditions of thought just as thinkers in those traditions — among them Buddhism — argued against, borrowed from, coopted, and repurposed the competition of their and earlier times. Also like them, Zhu began the task of philosophizing within a particular historical and cultural context in which certain ideas, orientations, problems, and styles constituted a shared paradigm for thinking. Understanding the context and precedents of Zhu Xi’s philosophy can often help us grasp the points he makes, and it adds new dimensions to our appreciation of all that he accomplished and how it came to be. This volume makes an unprecedented contribution to such understanding. Peter Bol is criticized for holding a version of this view (p. 34), though, as I note below, if we mean by this that such ideas were just in the air, part of a shared discourse, and just how Chinese intellectuals of this period thought about themselves and the world, in at least some cases such a view has considerable merit. For the history and significance of the mind-as-mirror metaphor that makes clear its distinctively Chinese origin and character, see Paul Demieville’s essay, ”The Mirror of the Mind,” tr. Neal Donner, in Peter N. Gregory, ed., Sudden and Gradual: Approaches to Enlightenment in Chinese Thought, (Honolulu: University of Hawai’i Press, 1987): 13-40. (Originally published as ”Le Miroir Spirituel,” Sinologica 1.2 : 112-137) and Harold H. Oshima, ”A Metaphorical Analysis of the Concept of Mind in Chuang-Tzu,” in Victor H. Mair, ed., Experimental Essays on Chuang-tzu (Honolulu: University of Hawai’i Press, 1983): 63-84. Xunzi, almost certainly borrowing from Zhuangzi, uses the metaphor of the mind as placid water that reflects the true state of affairs when its surface is not disturbed by the wind. Here we see a clear precedent for later images of the surface of a mirror obscured by adventitious dust, though Xunzi, unlike Zhuangzi or the Buddhists, thinks the mirror-like mind only allows one to begin to understand and respond to the world. Unlike them, he endorses a reformation model of self-cultivation. On the distinction between recovery and reformation models of self cultivation, see Philip J. Ivanhoe, Confucian Moral Self Cultivation, rev. ed. (Indianapolis: Hackett Publishing, 2000).